Mensusa https://www.mensusa.com/articles/crocodile-skin-belt-an-exotic-accessory.html Crocodile Skin Belt- An Exotic Accessory To Enhance Your Personality A crocodile skin belt is one of the most sophisticated accessories that gives the wearer a classy and stylish look. It compliments all colors and types of outfits to add glamor to your entire personality. When you wish to dress up in style, you need to pay heed to every part of your attire starting from the dress shirt to the footwear that you select. However, some men ignore the belts and just care less to choose the right kind of belt that goes well with the suit. But style conscious men are aware that even though a belt is a small accessory, it brings about a great difference in your looks. The crocodile skin belt is undoubtedly the ideal choice to get the picture-perfect look. It is no ordinary belt. It is made of exotic leather of crocodile and hence it creates an alluring look to the wearer on all occasions. 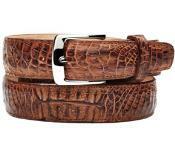 Owning a crocodile skin belt means that you can always create a smart look and never lag behind in style. Sometimes you do not know how to get the best looks. It is in such situations that a crocodile skin belt works like magic to enhance your total appearance. The uniqueness of this belt is that it never dominates your suit that you wear, rather complements it and thus makes you the center of attraction at every event. These belts are designer belts and are crafted by experts who take care to retain the genuine looks and feel of crocodile skin like the scales and rough appearance. As it is an exotic leather item, it is expensive as well but is worth the price as you can wear it with all kinds of suits to add style and elegance. Among the various types of exotic leather belts like alligator and ostrich and other animals. Crocodile skin belt has its own dignity and style that is incomparable. The variety in colors like different shades of brown, black, white makes it easier to choose the perfect one that goes well with the outfit. Some are simple while others are embellished with buckles and snaps. The original crocodile skin belt can be distinguished by the finish of the belt. The tough and rugged looks of the belt that can be broad or narrow according to your requirements, gives you the opportunity to flaunt your style preferences. MensUSA is the perfect store from where you can purchase authentic varieties of crocodile skin belt at the right price. Moreover, these belts are sturdy and durable and are the most important accessories that add a professional statement to your appearance. Next time you get ready for a party or a business meet, do not forget to wear your outstanding crocodile skin belt to turn the heads of all around and make a signature style of your own to stand out from the crowd.